Nokia, the Worlds leading Mobile Handset giant introduced new version of Nokia C5 mobile phone dubbed as C5-03. Nokia C5-03 is a touchscreen phone comes at affordable price. The New Nokia C5-03 phone has 3.2 inches touch screen display and equipped with 5 mega pixels camera with 4X digital zoom for video recording and quality pictures. Nokia C5-03 features Wi-Fi, for fast Internet access without the need or expense of a data plan. It also features a compass and assisted GPS for use with the latest version of the free Ovi Maps hands-free navigation service, now featuring public transport support and location sharing through social networks. With Nokia C5-03, you can put your most important contacts directly onto the homescreen so you can call, message or chat them up in just two taps. It measures 105.8 mm x 51.0 mm x 13.8 mm (L x W x H) and weighs 93gm. Nokia C5-03 comes with 40MB internal memory and up to 16GB external memory support. Nokia C5-03 3G phone is powered by 1000 mAh standard battery for long talk time of up to 11 hours for GSM and up to 4.5 hours for 3G. Standby time is estimated at 24-25 days. User can enjoy non-stop 35 hours music playback from new Nokia C5-03. The operating system is Symbian^1 (aka. 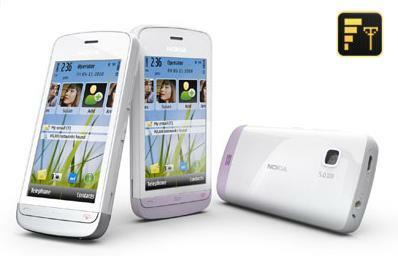 S60 5th edition touch-edition).Nokia C5-03 also comes with Bluetooth, and USB. Nokia C5-03 allows for easy email set-up – either an existing webmail or POP3 provider through Nokia messaging. For business users, there’s also the option of Mail for Exchange. If that isn’t enough, you’ll also find a quick setup wizard for Ovi Mail for users either new to email or who want a different account for their mobile messaging. As you’d expect, there’s also access to Ovi Music and the Ovi Store so you can fill your device with fresh content on a daily basis. Nokia C5-03 Price in India:- The new Nokia C5-03 will be available globally at the end of this quarter. Nokia C5-03 will carry the price tag of Rs.10500 approx. before taxes or operator subsidies.